The Alert 2016! report from the School for a Culture of Peace (Escola de Cultura de Pau), analyzes the World in terms of conflict and the possibilities of building peace. The report highlights the use of sexual violence as a weapon of war, as well as five possible scenarios for the building of peace. Libya, Nigeria, Somalia, South Sudan, Afghanistan, Pakistan, Ukraine, Egypt, Iraq, Syria and Yemen. These are the 11 armed conflicts recorded by the Escola de Cultura de Pau (ECP) during 2015 with the highest level of violence and, in some cases, with a death toll that is much higher than the annual index. This is what the Alert 2016! Report says; it analyzes the world from the perspective of armed conflict and the possibilities of building peace process based on four pillars: armed conflicts, tensions, peace processes and gender & security. 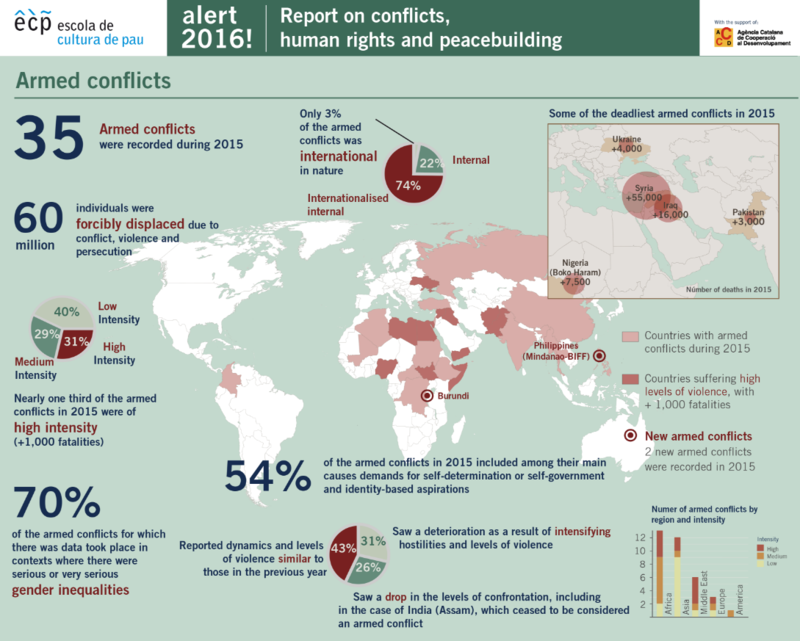 According to this report, during 2015, up to 35 armed conflicts were recorded: 13 in Africa, 12 in Asia, 6 in the Middle East, 3 in Europe and 1 in the Americas. 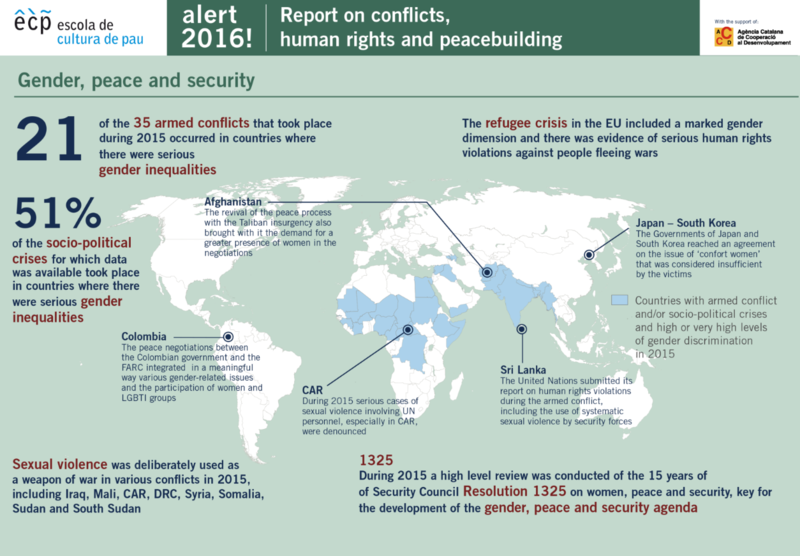 As said in the report, civilians continue to be most affected by the impacts of armed conflicts. The consequences come not only in terms of a death toll, which is high, but also from massacres and executions, arbitrary detentions, torture, multiple forms of physical and psychological abuse, and the recruitment of minors. The report also highlights two serious consequences: on the one hand, the forced displacements, as a consequence of violence, which according to the UNHCR, and based on the data available for the first half of 2015, reached the figure of 60 million people. On the other hand, the ECP underlines the use of sexual violence in armed conflicts, a practice used deliberately and at large as a weapon of war by armed actors in countries such as the CAR, the DRC, Iraq, Somalia, South Sudan, Sudan and Syria. 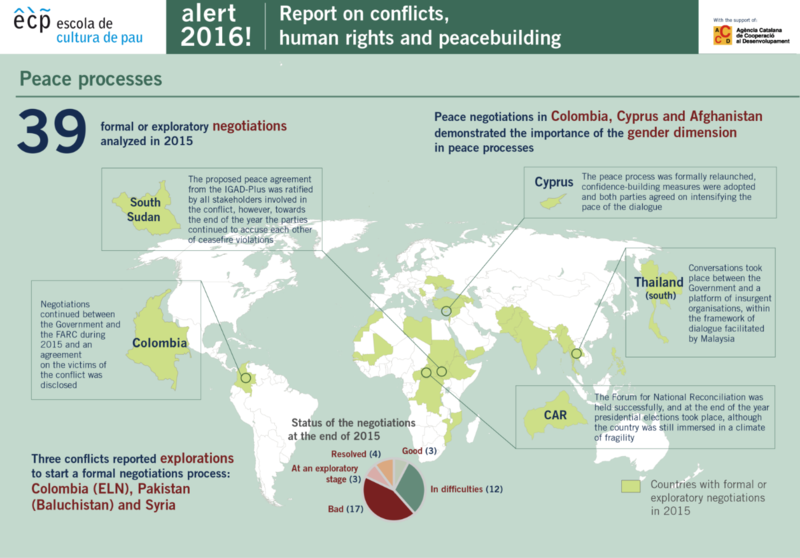 The report identifies 5 peace opportunities for 2016: the resumption of negotiations in Cyprus, the new political scenario in Burkina Faso, the exploration of peace scenarios in Thailand, the transition process to democracy launched in Myanmar, and the impact of the gender perspective in peace processes in terms of inclusion and sustainability. 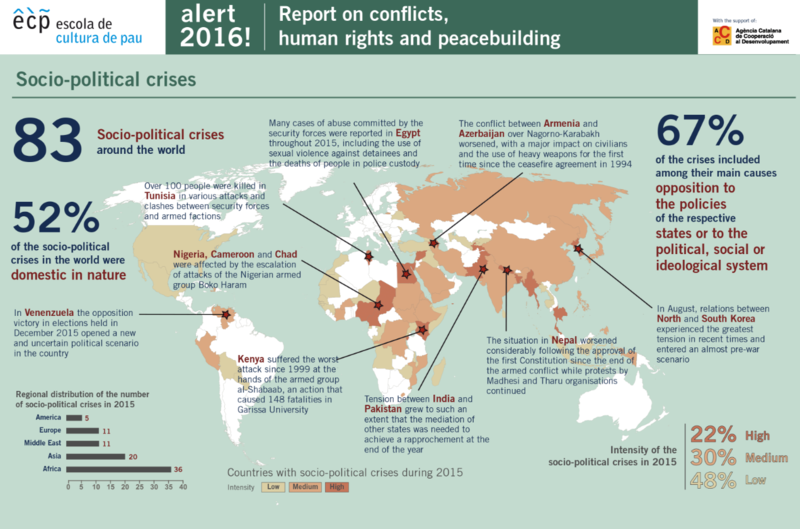 However, the report also indicates 10 alert scenarios for 2016: Burundi, on the verge of a civil war; stability risks in Mali, which is under the threat of actions by Jihadist groups; the surge in violence in the DRC; the fragile peace agreement in Sudan, the polarisation of powers in Venezuela; the impact of the lack of leadership legitimacy in the peace process in Afghanistan; the difficulties in the Mindanao process; the risks of growing tensions between Turkey and the PKK; the serious deterioration of the situation in Yemen after a surge in violence; and the effects of the Jihadist threat at a global level. They denounce their complicity with the Saudi coalition for the Yemen war when four years of the bloodiest conflict in the current history are fulfilled. The NGO Global Technology is a research tool on the use of technologies in the non-profit sector.